Kurdish cuisine (Kurdish: چێشتی کوردی‎ Çêştî Kurdî) consists of a wide variety of foods prepared by the Kurdish people. There are cultural similarities of Kurds and their immediate neighbours in Iran, Turkey, Iraq, Syria, and Armenia. Some dishes, such as biryani, are shared with the Indian subcontinent. Kurdish food is typical of western Asian cuisine. The Kurdish diet includes a wide variety of fruits and vegetables. Lamb and chicken are the primary meats. Breakfast is typically flat bread, cheese, honey, sheep or cow yogurt, and a glass of black tea. For lunch, lamb and vegetables are simmered in a tomato sauce to make a stew usually served with rice and savory dishes are usually served with rice or flat bread (Naan). Kurdistan has a climate and soil suited to grapes, pomegranates, figs, and walnuts. Kurdish honey has a clear light taste and is often sold with the honeycomb. Kurdistan also produces dairy products from sheep and cow milk. Kurds make many types of kofta and kubba, dumplings filled with meat. Kurdish cuisine makes abundant use of fresh herbs. Sweetened black tea is a very common drink, along with bitter strong coffee. Another favourite Kurdish drink is "mastow" (Sorani) or "Ava Mast", which is yogurt and salt mixed with water (Doogh). Staples of Kurdish cuisine are berbesel, biryani, dokliw, kellane, kullerenaske, kutilk, parêv tobouli, kuki (meat or vegetable pies), birinç (white rice alone or with meat or vegetables and herbs), and a variety of salads, pastries, and drinks specific to different parts of Kurdistan. Other popular dishes are makluba, kofta, shifta, shilah/maraga, spinach with eggs, wheat & lentil soup, beet & meat soup, sweet turnip, cardamon cookies, burgul pilaf, menemen, mehîr, ûr û rûvî, yaprakh, chichma this dish is common in Erbil (Hewlêr), tefti, niskene and nane niskan. One of the popular Kurdish dishes is Kardupilau, which is popular in Piranshahr and Mahabad. Sawarr, a traditional dish among Kurdish farmers, is made of wheat grain that is boiled, sun dried and pounded in a mortar (curn) to get rid of the husk. The wheat is then crushed in a mill (destarr). The resulting grain food can be boiled and served. Tapsi is a dish of aubergines, green peppers, courgettes and potatoes in a slightly spicy tomato sauce. Tashreeb consists of layers of naan in a sauce of green pepper, tomato, onions and chillies. A typical Kurdish breakfast consists of cheese, butter, olives, eggs, tomatoes, cucumbers, green peppers, reçel (jam/marmalade; a preserve of whole fruits) and honey usually consumed on top of kaymak. Sausage, baked goods and even soups can be taken as a morning meal in Kurdistan. Perhaps more so than traditional breads such as pide, a crusty white loaf is widely consumed. A common Kurdish speciality for breakfast is called menemen, which is prepared with roasted tomatoes, peppers, olive oil and eggs. Invariably, black tea is served at breakfast. During the festival of Newroz, Kurds enjoy picnics in the countryside, eating traditional food, often with dolma, and dancing the traditional Kurdish dance called Halperke. Kurdish people also enjoy Eid food such as chicken, rice, dolma and biryani. ^ "Kurdistan's cuisine". Krg.org. 2010-06-27. Retrieved 2012-05-21. ^ "Middle East". Web.archive.org. 2008-02-01. Archived from the original on February 1, 2008. Retrieved 2012-05-21. ^ "The food that launched civilization". Google.com. 2012-05-05. Retrieved 2012-05-21. ^ "Iraqi Kurdish, Life Style". London: Guardian.co.uk. 2007-04-07. Retrieved 2012-05-21. 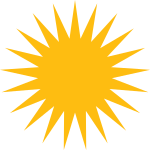 Wikimedia Commons has media related to Kurdish cuisine. This page was last edited on 25 March 2019, at 14:52 (UTC).